FIX RADIO/LONDON, the DAB and online radio station targeting the city’s tradespeople, is roaming LONDON handing out bacon butties, the traditional English breakfast sandwich (bacon and HP sauce on a buttered roll), to workers at construction sites in reaction to a shortage caused by the hot SUMMER weather that has affected the fertility of pigs and has caused bacon prices to jump. Bob FM breakfast presenter and programme director is joining Fix Radio as its new PD. Graham has worked for a number of stations in Australia and the UK including 2CR, BRMB and various BBC local radio stations. He presented the TFM breakfast show for four years and won a Sony Radio Gold for Best Breakfast Show on BBC Wiltshire. Fix Radio has launched Fix Media after taking over the running of Facebook page Tradesmen Banter, which has half a million active followers. Fix Media will give advertisers and sponsors the opportunity to reach more tradespeople than just the radio listeners alone, with bacon butty site tours, lead generation campaigns, video creation and now access to a bigger social media following. 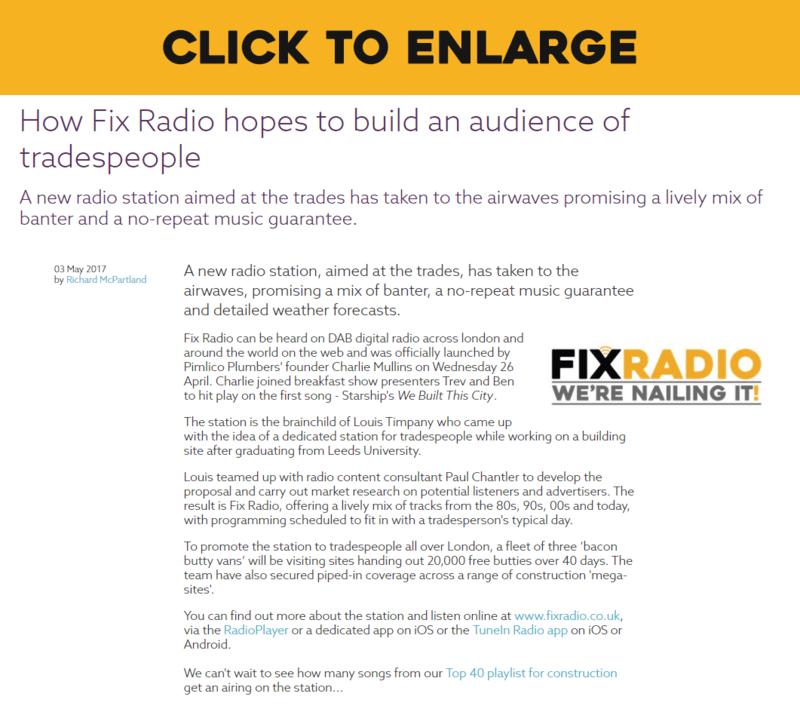 The entrepreneur behind Fix Radio, a London station aimed at tradespeople, is planning to make his station a national one and believes DAB will remain the platform of choice for some time yet. The Construction Industry never looked better. Building work going everywhere in good old London Town, whistling tradesmen and banter at the bacon butty Van. It’s the business to be in. FIX Radio is the new radio station rocking the airwaves is just for the local builder. It is reasonable to assume that Fix Radio, the new “radio station for tradespeople”, has been launched with an eye on a slice of the advertising for van hire and building materials out of which TalkSport has made a very nice business. Book A Builder UK are being promoted on Fix Radio throughout London for the next 40 days. The company will be featured on van advertisements and radio commercials. The Bacon Butty Tour has officially started! 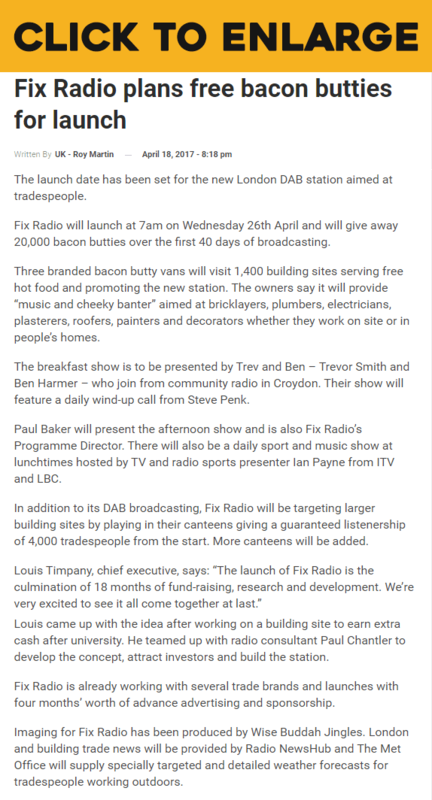 Fronted by Fix Radio, the tradespeople’s radio, the next 40 days will be spent touring round key work sites in London, where six promotional staff from the radio station will be handing out free bacon sandwiches to tradespeople across the city. A new radio station aimed at the trades has taken to the airwaves promising a lively mix of banter and a no-repeat music guarantee. 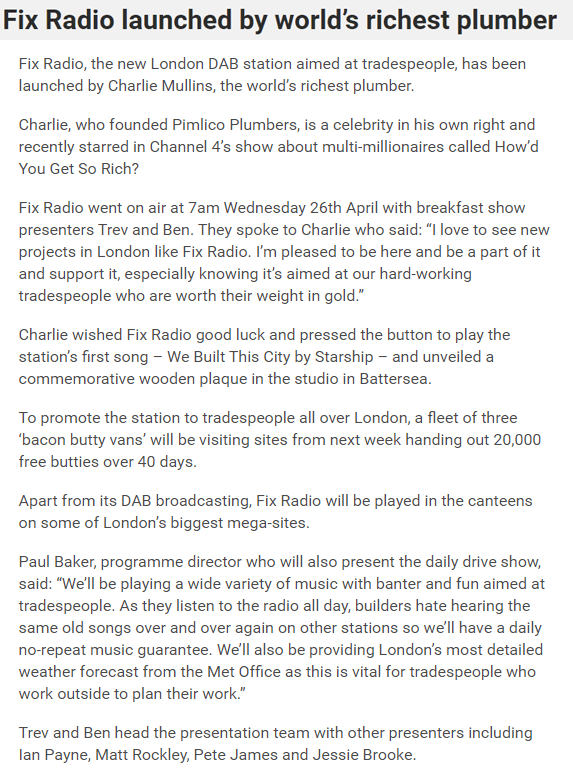 Fix Radio can be heard on DAB digital radio across london and around the world on the web and was officially launched by Pimlico Plumbers’ founder Charlie Mullins on Wednesday 26 April. Charlie joined breakfast show presenters Trev and Ben to hit play on the first song – Starship’s We Built This City. A new radio station targeted at builders and plumbers is set to blare from white vans across Britain. Fix Radio, the first station aimed exclusively at tradespeople, began broadcasting this week. Promising to deliver upbeat tunes for roofers and carpenters to whistle while they work, Fix Radio’s DJs will engage in the kind of “cheeky banter” enjoyed by its target audience. 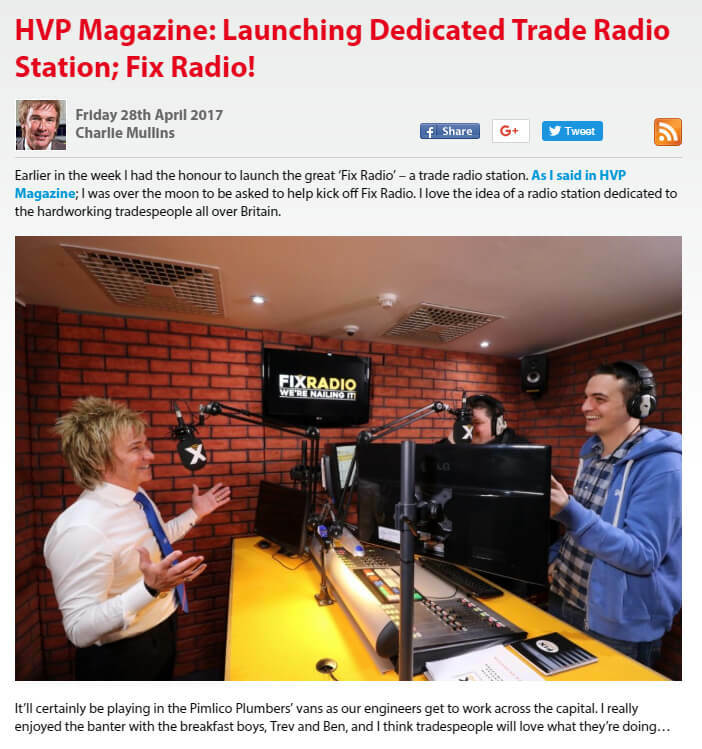 HVP Magazine: Launching Dedicated Trade Radio Station; Fix Radio! Earlier in the week I had the honour to launch the great ‘Fix Radio’ – a trade radio station. As I said in HVP Magazine; I was over the moon to be asked to help kick off Fix Radio. I love the idea of a radio station dedicated to the hardworking tradespeople all over Britain. 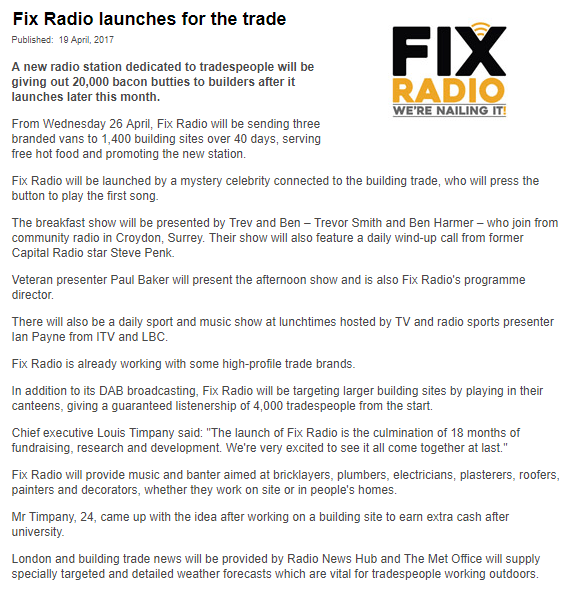 Fix Radio takes to the airwaves – The UK’s first radio station for tradespeople. 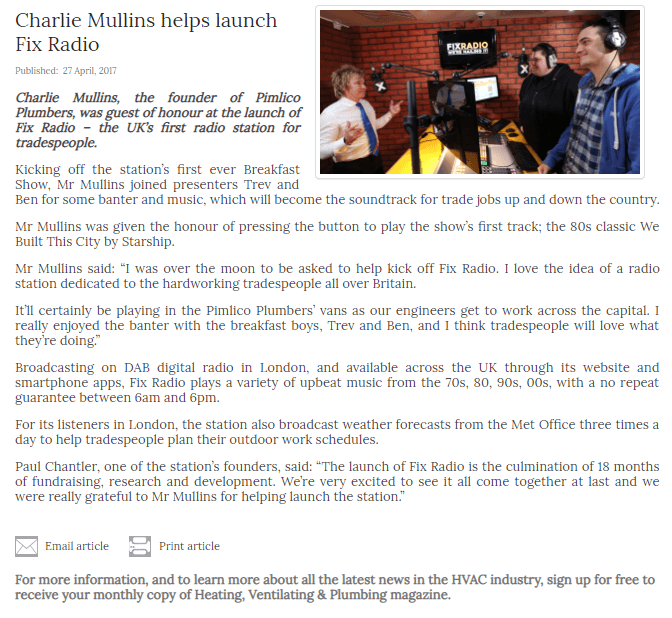 Charlie Mullins – founder of Pimlico Plumbers – was guest of honour at the launch of Fix Radio – the UK’s first radio station for tradespeople. Kicking off the station’s first ever Breakfast Show, Charlie joined presenters Trev and Ben for some banter and great music, which will become the soundtrack for trade jobs up and down the country. 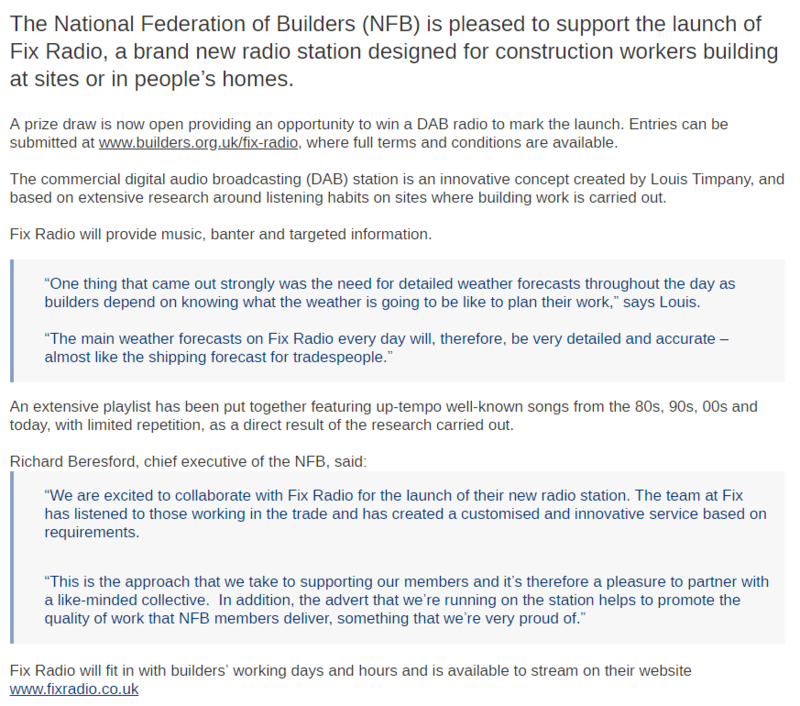 The National Federation of Builders (NFB) is pleased to support the launch of Fix Radio, a brand new radio station designed for construction workers building at sites or in people’s homes. A prize draw is now open providing an opportunity to win a DAB radio to mark the launch. Entries can be submitted at www.builders.org.uk/fix-radio, where full terms and conditions are available. Charlie Mullins, the founder of Pimlico Plumbers, was guest of honour at the launch of Fix Radio – the UK’s first radio station for tradespeople. Kicking off the station’s first ever Breakfast Show, Mr Mullins joined presenters Trev and Ben for some banter and music, which will become the soundtrack for trade jobs up and down the country. TV comedy stars Lee and Dean are joining Fix Radio, as the station for builders and tradespeople celebrates its first birthday today. The builders, who star in Channel 4’s new comedy show, will become Fix Radio presenters for special shows on both Bank Holiday Mondays in May. Fix Radio, the new London DAB station aimed at tradespeople, has been launched by Charlie Mullins, the world’s richest plumber. Charlie, who founded Pimlico Plumbers, is a celebrity in his own right and recently starred in Channel 4’s show about multi-millionaires called How’d You Get So Rich? A new radio station dedicated to tradespeople will be giving out 20,000 bacon butties to builders after it launches later this month. From Wednesday 26 April, Fix Radio will be sending three branded vans to 1,400 building sites over 40 days, serving free hot food and promoting the new station. The launch date has been set for the new London DAB station aimed at tradespeople. Fix Radio will launch at 7am on Wednesday 26th April and will give away 20,000 bacon butties over the first 40 days of broadcasting. A new radio station aimed at builders and tradespeople is being launched in London soon. Fix Radio says it will provide music, banter and information targeted at bricklayers, plumbers, electricians, plasterers, roofers, painters and decorators whether they work on building sites or in people’s homes. Fix Radio need your help in building the best radio station in London for tradespeople, builders merchants and construction sites. The station, which is planning to launch on DAB digital radio in and around London soon, has twenty questions lined up, focusing on what sort of radio station you’d like while you work. It promises to take your answer into account while it builds the station around its listeners.